As the old adage goes- it is not the destination it is the journey that matters. Putting up the new mast on Bente Dorte was no exception. Here in Croatia things can be simple and things can be hard. In this case it was simply hard. Putting up a new mast on a boat or yacht usually goes something like…..talk to the rigger, order the mast, put on the rigging, get the crane to hoist the mast. Then tighten the rigging and put on sails, and see if it all holds. When we went looking for the new mast on Bente it was a little different, we didn’t go to a rigger first. Instead we went to the forest. 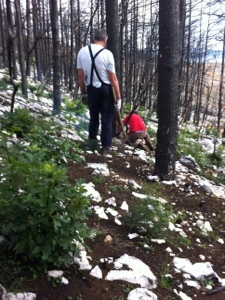 Captain Krešo, of the Bente Dorte, had learned about an area of strait evergreens which had burned in an extremely hot fast moving fire. 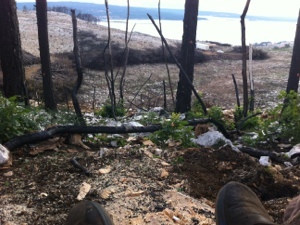 The flames were fanned by the famous Bura wind that blows down the mountain. And Bura is nothing to laugh at. Its speeds sometimes reach more than 120 knots and have been known to blow trucks right off the highway. But that fearsome wind also made these evergreens stout as iron, they have evolved to withstand the force of the Bura. The trees grow straight and tall, drying in the wind and sun better than any commercial lumber yard. 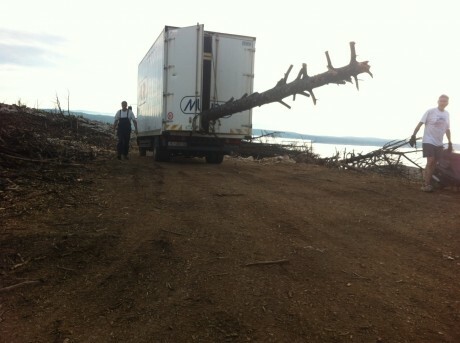 In the midst of a ravaged forest on a windswept hillside we found the a tree we wanted, it was a little over 14 meters long, just right for us to carve a new mast. In principle, once we found the tree it should have been pretty straight forward: pull out saw, cut tree down, load tree in the truck, and drive to workshop and carve the mast. It turned out to be a little more complicated. The tree we wanted was at the top of the hill not close to any road, with little access for any vehicle to reach that high on the hillside. 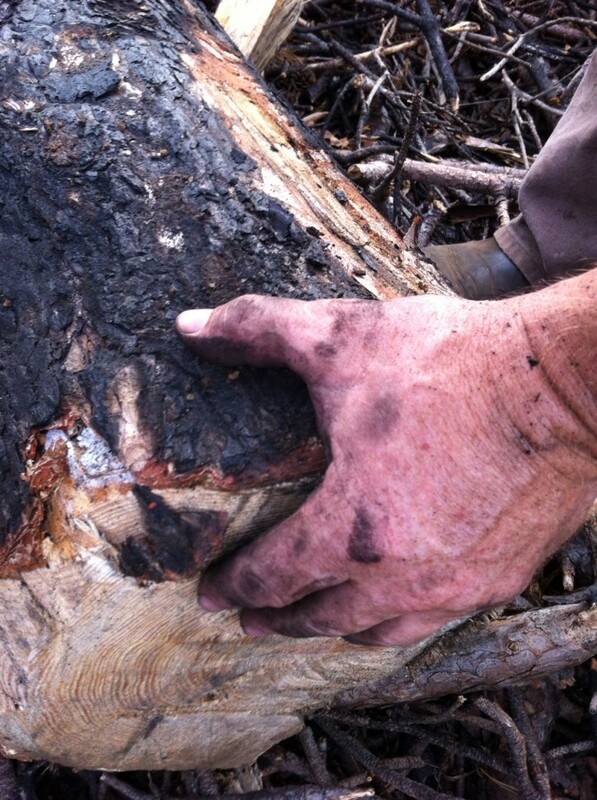 Our chainsaw worked, but had been used previously to cut up an old ship so the chain was dull from cutting nails. 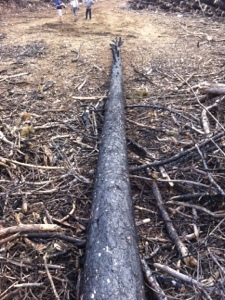 Then the forestry department showed up half way through, curious about what we were doing. So we followed our basic plan. But it took a lot more effort and time than anticipated. We cut the tree, dragged it by hand down the mountain side, loaded it into a box truck and off we went. But it could have been even more difficult, just getting that tree back to the workshop. Luckily, Krešo speaks the local Cakavian dialect. He is good with politics. He has several strong friends to haul that tree around. I was there too, but mostly for inspiration. “Sure, no problem, we can drag that thing down the mountain, no problem.” My trail crew days made me the most experienced lumberjack of our group, so I wasn’t as surprised as the others at how heavy and unwieldy a 14 meter tree can be. Well we managed at this simple task, and I never said it would be easy. Part II – Mast Making or Do you mind if I put a tree in your back yard?